Dan Lynch anchored WSU’s offensive line in the early 1980s. A four year starter, he was a two time unanimous All PAC-10 selection in 1983 and 1984 and he capped off his career with an All American selection in 1984. He is remembered for authoring one of the great pre-game lines in Apple Cup history stating before the 1984 game, “There are four important stages of your life. You’re born. You play the Huskies. You get married. 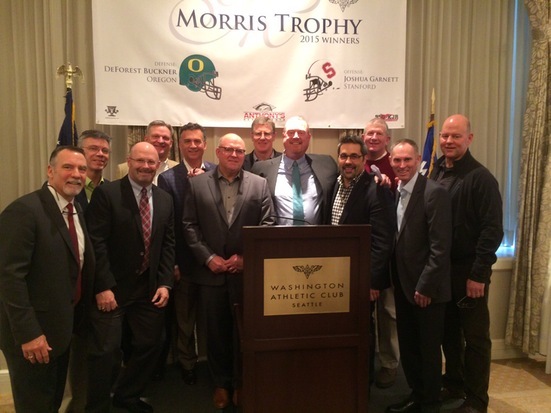 And you die.” He was a unanimous winner of the Morris Trophy in 1984 and remains the only Cougar offensive player to win the award. After a brief stint in the he began a business career in Prague, Czech Republic where he’s lived for nearly 30 years. He returned to Seattle to speak at the 2015 Morris Trophy luncheon and was joined by several teammates and college friends (photo).